Inspectors must be confident that your goods are properly sourced and labeled. Shippers have to trust that your wares are packed securely enough for travel. Wholesalers often require bulk packaging options and easy tracking solutions. Retailers must guarantee the integrity of every product they sell — including yours. From the farm to the dinner table, how your food is packaged can mean the difference between a successful sale and unused inventory. Again, presentation matters. As one of the top food packaging companies, we specialize in customized packaging solutions made to order, no matter where you exist within the larger supply chain. 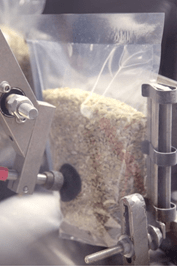 When you choose to outsource contract manufacturing and dry ingredient processing to our team, you can specify that we use nearly any type of food packaging, labeling or delivery option. From retail pouches to fiber drums to railcar transport, the range of our capabilities is as wide as it is reliable. We even offer re-packaging options for those who need ingredients prepared for subsequent production stages down the line. Below are just some of the food packaging solutions that we offer. If you have questions about any of these customizable options, schedule a free appointment with our team today. At both of our production facilities, we can process products into or from bulk bags, multi-wall bags (valve, open mouth, or dairy), poly bags, drums, bag-in-box, Gaylord boxes, bulk trucks or bulk rail. Our Hammond facility has the ability to provide gusseted stand up or lay flat pouches with a variety of options as well as cartons that can either have the pouches we produce inserted into them or be filled directly with product. Our product labeling options include laser or inkjet printing, labels, stamps, stenciling, pre-printed stickers, or pre-printed bags. We can unload or load into both bulk trucks and railcars. Our Hammond facility can service up to 5 railcars at a time. Our Mooresville plant can service up to 22 railcars, including 8 indoors. 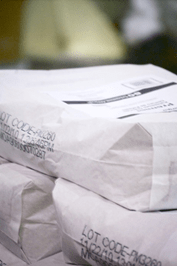 We can receive and warehouse inbound shipments of your packaging materials for a toll packaging process or source them on your behalf as part of a turnkey contract manufacturing solution. The right food packaging can make a tremendous difference. You want options that best secure your products, make shipping and storage easy, and best satisfies your customers or consumers. From drums to retail pouches, PacMoore has the food packaging you need. How will the right food manufacturing products help you run a better business? Read about our various food packaging product types. Food packaging pouches come with a variety of options, depending on whether you need your product to lay flat, stand upright or more. They can be machine sealed to include zippers or tear notches or gussets. Pouches are perfect for tightly sealing and preserving food products for shipping or storing. They can also easily be placed in other packaging such as retail cartons or display shippers. Cartons have been a popular retail and foodservice option for many years. Cartons provide product protection and can be filled directly with product or have pouches inserted in them for an additional product barrier. Like retail pouches, cartons quickly convey brand image and product details. They can also be resealed for easy storage. Like pouches, industrial food packaging bags are excellent for protecting food products from moisture and more. Typically available in paper, our food packaging bags are made to be easily opened, as needed. Packaging options vary in terms of number of layers, poly coatings and types of openings. They can be sized to the exact amount of product you need in further production. Boxes are perfect for shipping and storing various food products. The boxes we carry come in different sizes and have such features as corrugated exteriors, sealed interior poly bags and separate corrugated lids. Boxes are great for protecting food products that are easily damaged by weight if stacked in other types of less rigid packaging. Drums offer a secure option for convenient shipping of food products. The drums we carry are made from fiber or plastic and include a sealed interior poly bag. They can be firmly sealed and secured with sturdy lids. When strength and structure matter, our selection of drums are perfect for packaged food supply. Not only can we provide retail or industrial packaging options but we can also provide you with the bulk alternatives you need because of our rail and interstate access. We offer bulk trucks and bulk railcars created specifically for shipping food materials. Our trucks and railcars are designed for easy loading and unloading, and provide a secure means for transporting food. An industrial use large bag weighing up to 3,000 pounds with a nylon exterior and poly-coated interior or sealed interior poly bag. An industrial use mid-size box with a corrugated exterior and sealed interior poly bag. An industrial use large box (also known as a tote or bulk bin) with a sturdy corrugated exterior, sealed interior poly bag, and separate corrugated lid. PacMoore is a leading food packaging manufacturer with a variety of customization capabilities. Food packaging is one of the most important elements for keeping consumers safe, and it’s what draws them to your brand in the first place. You want a food packaging manufacturer that understands that importance and delivers top-quality packaging work every time. Our standard capabilities cover many food packaging needs, and our custom food packaging services give us the flexibility to provide you with packaging specific to your product. Learn more about quality food packaging, the options we offer, and how PacMoore can be a valuable business partner for you. Packaging serves multiple purposes for a food manufacturer: In addition to being the first line of defense against harmful contaminants, it’s the first feature your customers will notice. Quality brands distinguish themselves with compelling, attractive packaging that is easy to open, reseal and store. At PacMoore, we know food packaging. We know what works, what sells and what keeps customers coming back for more. From a standard pouch in carton to more complex master shipper designs, we are able to deliver what you want and need. Food manufacturers trust PacMoore to provide high-quality packaging services. We specialize in custom food packaging delivery that helps you meet your business needs. Our options range in size and functionality, and we can customize to your specifications. PacMoore is a recognized name in the food industry because of our approach to serving the customer. With comprehensive food packaging services, we can offer piecemeal or turnkey solutions. Whatever the service — from processing and packaging to warehousing and shipping — we aim high. At PacMoore, we take all necessary steps to ensure customer satisfaction. Our team works closely with yours to identify both needs and solutions. To learn more about what PacMoore can do for you, contact us today. Do you have additional questions about our Packaging Products?